It is impossible to live without water. Even if you are drinking water but are not drinking enough, you will still end up dealing with complications. It is important to increase your water intake to prevent dehydration, but you can also drink water at certain times to maximize its benefits. Drinking water after eating your meals has its benefits, but how? Is Drinking Water After Eating Okay? Yes, and drinking water after a meal has its benefits. In many cases, it helps improve your digestion by making it easier for your body to break down food and transport it easily through your digestive tract. If your diet includes plenty of vegetables, fruits, and whole grains, it is important to increase your water intake to enjoy the amazing benefits of these veggies and fruits. The reason is that they contain fiber that adds bulk to your stool and prevents constipation and other digestive problems. But, you need to drink water to ensure that fiber passes through your digestive system as smoothly as possible. To understand it, you have to understand the process of how food travels to your stomach, intestines, and then out of your body. When you eat something, it passes through your esophagus and reaches your stomach. The whole process takes no more than 2-3 seconds. After it reaches your stomach, it is broken down into smaller pieces. The process requires water to complete smoothly. Gastric juices in your stomach will also play a role in here to break down food – water has nothing to do with the dilatation of gastric juices. Next up, the food enters your small intestines where proteins, vitamins, carbs, minerals, and fats are extracted from the food. Again, water plays an important role here, as it lubricates the digestive tract and ensures easy passage of the food. The process can take up to four hours. After the extraction of all minerals and essential nutrients, there remains a thin, watery mixture that enters your large intestine where any leftover water and nutrients are absorbed and the remaining goes out of your body. Water helps in every step of digestion, and after digestion, the water you have drank after your meal helps keep your body hydrated. While drinking water after eating is a good idea, you should avoid it after eating spicy food. Peppers contain a specific compound called capsaicin, which produces a burning sensation after being exposed to human tissue. When you eat spicy food, a pain receptor (TRPVI, the same receptor that is responsible for helping you know that food is too acidic or hot) binds with the capsaicin molecule. This signals your brain that you have eaten something that may not be right for you. The pain signal will become intense depending on the amount of capsaicin found in your food. That is the reason why you notice your eyes become watery and nose start running. You may even start sweating heavily. Capsaicin has non-polar molecules and can only dissolve with other similar molecules. Since water has polar molecules, it is not going to offer any cooling effect. In fact, it will make your mouth feel hotter by spreading the capsaicin molecules around. What About Drinking Before Eating? Drinking water after eating meals provides numerous benefits, but you can also enjoy some specific benefits by drinking water before eating. It helps you lose weight: Drinking a glass of water before your meals will help you eat fewer calories, which will help lose weight. This usually happens because water provides you with a sense of fullness and makes you eat less. Drinking water is even better than drinking an empty-calorie beverage. It improves your skin: If you are worried about your rough, dry skin, simply drink more water throughout the day and especially before a meal. This keeps your skin hydrated and improves its overall texture and appearance. After waking up: Drinking a glass of water soon after waking up in the morning helps activate your internal organs. It also helps get rid of any toxins in the body. 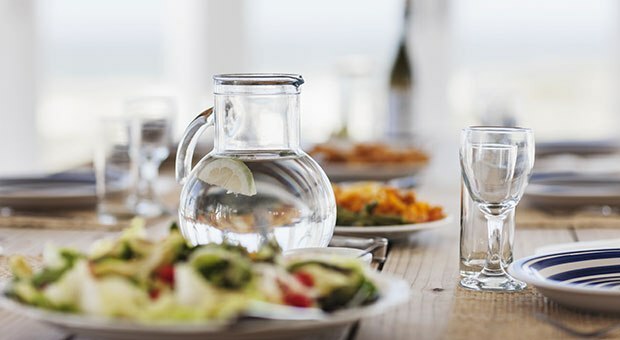 Before a meal: Drinking a glass of water about half an hour before a meal improves digestion. 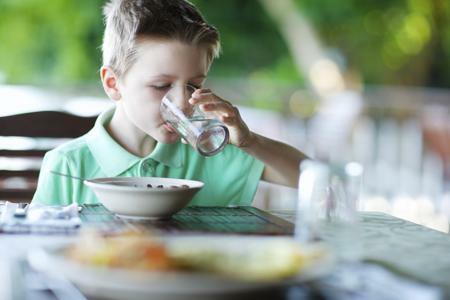 It is a good idea to avoid drinking water too soon before or after your meal to avoid diluting the digestive juices. Wait for an hour after your meal to drink water. Before a bath: Drinking a glass of water before you take a bath helps lower your blood pressure. Before seep: Drinking water an hour before you go to sleep helps replenish any loss of fluid during the night. Is Chocolate Milk Good for You? Why Do You Have Headache When Working Out? Why Does My Face Get Red When I Drink? Why Should You Eat a Banana Before Workout?